I decided to make some Christmas goodie bag/box things. 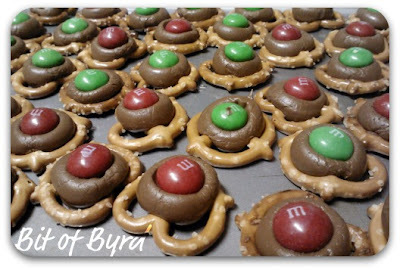 In them I decided to put m&m pretzel things. I am making other things too, but this are so good and easy! No...really, it is as easy as pretzels on the cookie sheet, kiss on top.. heat and add M&M. She said 275 for 3 minutes. Mine needed 4. sounds like it isnt much... but that extra minute was the difference of a good smoosh or a half smoosh. Do you bake for Christmas? What have you made this year?